Peel the beetroot and cut in to small cubes. Pressure cook the beetroot with enough water and salt until soften. Now,make the thick masala by grinding above said ingredients. Heat oil in a wok, add onion and curry leaves and fry well. Add ginger garlic paste and fry well. Now add the ground masala and required water. Let it cook for 10 minutes. Add salt and cooked beetroot in low flame. Cook for few minutes and add coriander leaves. 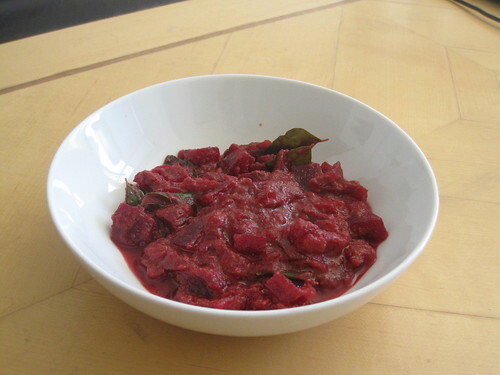 Now beetroot kurma is ready. 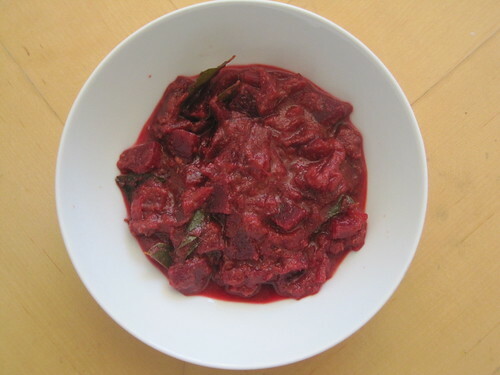 Beetroot kurma can be served with any type of Indian bread. This South Indian recipe goes well with Chapati.